NOTE after Hurricane Florence: The Tiki Cottage came through Florence with no harm. We feel so fortunate. For those considering a stay or scheduled to stay, our cottage and the island are doing great. Come on down. Enjoy the easy life of beach living while staying at our little slice of paradise. Centrally located, this wonderful beach retreat is only 1 short block from the beach, and a quick walk to the Kure Beach Pier, local restaurants, ice cream store, and shops. This charming coastal cottage has been updated and includes a double bed in one bedroom and two sets of bunk beds in the other bedroom. Enjoy family time with all the comforts of home. There is a TV/DVD with cable, wireless internet, and board games galore. The kitchen includes a breakfast bar with additional seating (no dishwasher but full size fridge, stove/oven, and microwave), and the large bathroom has a stack washer and dryer. This is a bright, happy, cheerful place to vacation. While we love our charming cottage, please note that it is not a brand new property and does not have granite countertops, stainless steel appliances, and brand new cabinets. it is clean, comfy, cozy, and charming, and it offers plenty of conveniences (water pitcher with filter, coffee grinder, blender, picnic basket, and more). The cottage is tastefully decorated and kid friendly. An outside private shower allows you to rinse off after a day of fun at the beach. The large front deck is the perfect place to enjoy sunrises, afternoon cocktails, and evening meals. There's plenty of room for parking, and trailored boat parking is also allowed. Year-round neighbors are friendly and quiet. The beach is beautiful; the water warm and clear. Enjoy miles of unspoiled beaches, visit the NC State Aquarium or the Ft. Fisher Historic Site and Museum, take a charter fishing boat or dinner cruise excursion, or travel on the Ft. Fisher Ferry to the wonderful fishing village of Southport. On two of the local beaches, you can go 4-wheeling; and there is a beautiful State Park that offers a picnic area, walking trails, a marina, and public boat access. There are plenty of activities on the island to keep your family busy and entertained after a day at the beach. Off of the island, there are several area golf courses and a waterpark. The vibrant riverfront town of Wilmington is only a short drive away, and offers fabulous restaurants, shops, a Saturday Farmer’s Market in season, walking tours of beautifully restored historic homes, ghost tours, and cultural activities. Come experience all that Kure Beach has to offer, in a location and cottage that exudes the feeling of a small-town beach community. Kure Beach and the Wilmington area is fantastic. Wilmington is such a cool city with tons of restaurants and so much to do. Kure Beach and Carolina Beach are lovely vacation spots, with just enough 'touristy' stuff to keep you happy without the area feeling tacky and overbuilt. The beaches here are magnificent, the people are friendly, and there is lovely weather year-round. We hope to retire to our cute little cottage in the future. This cottage is the essence of rest, relaxation, and happiness. When we were looking at properties to buy, we saw magnificent huge homes and condos. Yet the second we walked into the cottage, it was love at first sight. My son said, 'This is it. We don't need to look any more.' We hope you will feel as enamored of this restful little cottage as we are. Beach is a mere 452 feet away, a very short walk. Backyard has fenced dog run and front has large, grassy lawn. Three bikes, helmets, and a bike lock are available for guests' use. Small beach toys, shovels/pails, beach chairs, beach cart, and beach umbrella are available for your use, along with a few small boogie boards. Large front deck for dining and relaxing, outdoor shower, full clothes line for hanging beach towels, washer and dryer, three adult-size beach cruiser bikes and helmets,CD Boombox player with IPOD jack and cord to play your music, lots of family-friendly board and card games. Nearby park with tennis courts, basketball court, dog park, playground, and frisbee golf course. Cottage has tennis racquets and balls and a basketball for your use. Loved the tiki cottage as always. Just like home away from home. Can't wait to come back. This was our first time staying at the cottage. You felt right at home. We definitely will be back!! We had a wonderful stay! !Love your cottage.. Loved Tiki cottage. Rested and relaxed. It had everything I needed. Would definitely come back. Absolutely delightful! 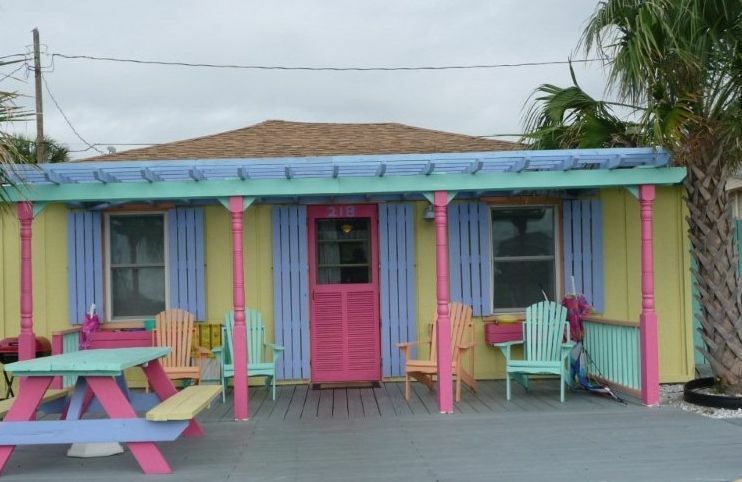 The tiki cottage was a perfect mix of southern charm and comfort. It had everything we needed and was a 30 second walk to the beach. My daughter loved the bunkbeds, and slept on a different one every night! It’s also extremely close to the pier and plenty of restaurants and activities, including the aquarium at Fort Fisher. I would highly recommend it for any family, especially those that travel with their dogs, as the area is very pet friendly as well. Thank you for a lovely And relaxing getaway! I have to say that this rental was adorable! It is in a great location, making it easy to walk to the beach in about 2 minutes. There is also parking across the street that is free to the public (just get there early enough to get a spot) :) You don’t have to worry about noise from neighbors above you or beside you, which is not the case when staying in a condo! This cottage is also within walking distance to restaurants, etc. We rented a golf cart for the week and had a blast driving it around Kure and Carolina Beach!!! You will need to bring an extension cord with you if you decide to rent a golf cart so that the charge cord can reach the outdoor outlet. I found this rental to be well kept and clean. We have already decided to come back to the Tiki Cottage in the fall because we miss it so much already!!! 3 miles to NC Aquarium and 4 wheel driving on beach. 3 1/2 miles to ferry boat to Southport. 3 miles to Carolina State park with boat ramp access and shopping. Two short blocks to a nice local park with tennis/basketball courts, dog park, bocci ball, frisbee golf, and playground/picnic area. Best donuts on the planet at Britt's donuts in Carolina Beach. See live bands, free movies, and fireworks all summer...check Pleasure Island website calendar for details. Kure Beach is a quiet, relaxed family friendly community. Wilmington has lovely Victorian homes, beautiful river walk, and fabulous restaurants. Reservation is not secure until signed contract and 50% deposit is received. Owners reserve right to rent by the week only during high season. Memorial and Labor Day Rates are $170 a night for Friday-Monday stay. Check for special rates on last-minute rentals!